Elle Ferguson, Bwog staff writer and person who gets hungry just thinking about food, reports on the second annual Battle of the Dining Halls. The second annual Battle of the Dining Halls took place yesterday at Roone Arledge Auditorium in Lerner. All three Columbia dining halls – John Jay, Ferris, and JJ’s – made one special dish to present to student attendees and later a panel of judges, for the chance to win one or both of the prizes offered: the Students’ Choice Award and the Judges’ Choice Award. Each dish had a special theme, as well as an alternative vegan option (disclaimer: I ate none of the vegan options, but I’m told by the judges that they were also delicious). This year’s panel of judges, which tried and critiqued each dish in the latter half of the event, featured Chef Alex Guarnaschelli, a judge from Chopped. For the first half of the event students packed into the auditorium and lined up at the dining hall’s booths to try their food. After tasting each dish, they could go to a special link and vote for which dining hall they thought had the best dish. JJ’s presented a “Bacon Grilled Cheese and Tomato Soup Dumpling.” This dish was made with a smoky tomato soup inside a dumpling wrap with grilled parmesan cheese on the bottom, topped with bacon jam and micro basil. The inspiration for the dish came from two favorite college student dishes, soup dumplings and grilled cheese. 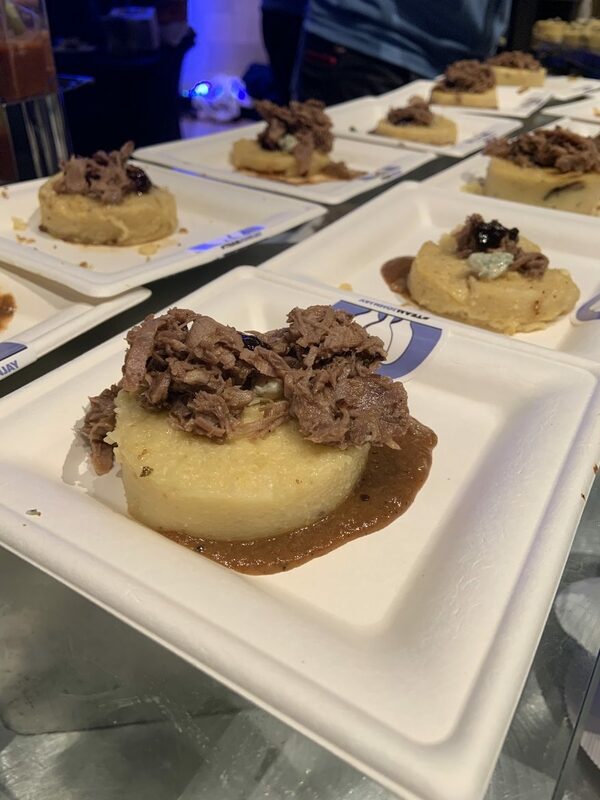 John Jay crafted a “Herb Crusted Braised Lamb on Blue Cheese Polenta Bun.” Of all the dishes served, this one required the most preparation as the cooks let the lamb marinate for two days beforehand and hand-made each polenta bun. The new chef manager at John Jay said he was inspired by the concept of homecoming: “When you get home, what do you get from your mother? A hardy roast.” His staff added twists to the recipe of a classic roast by choosing lamb instead of beef, pulling the lamb instead of roasting it, and using polenta instead of potatoes. Ferris prepared “Nonna’s Italian Spaghetti and Meatballs,” a classic, savory dish with spaghetti, beef and veal meatballs, parmesan cheese, and marinara sauce. The chef behind this creation said his primary inspiration was “love,” as a tribute to a grandmother’s home-cooked meal. “Everyone loves grandma’s cooking, and I hope you love our cooking today,” he said to students. After the students had tried the food and voted for their favorite dining hall, it was time for the judges to critique the same dishes presented by Ferris, John Jay, and JJ’s. The judges’ panel then tried JJ’s tomato soup dumplings. Chef Guarnaschelli complimented the risk and creative agency taken by JJ’s staff, but would not say if it was risky in a good or bad way. Overall Guarnaschelli was more complimentary of the creativity and the structure of the dish than its taste, which she left out of her critique. The third and final dish to be presented to the judges was the lamb and polenta from Ferris. From Chef Guarnaschelli this plate received the most praise for its thoughtfulness in the preparation process, taste, and presentation. By the end of the event, the host announced the winners. Taking the Students’ Choice Award was JJ’s, followed by Ferris receiving the Judges’ Choice Award.